This article was written back in June to be ready for the start of fiesta and the launch date of Peter Milligan’s book, ‘Bulls Before Breakfast’ But unfortunately, the chap at Sanfermin.com who posts them onto the web for me, Mr. Testis, was busy preparing for fiesta, and since then he has been even busier either getting his cojones fixed or making many cows happy (Mr. Testis: It´s true). But finally, after a little over three months, here we have it, a wee review of three fiesta related books written over the last forty years…and a fourth, Peter’s, published just three months ago. I haven’t changed the article, so it’s very much a ‘fiesta-is-practically-pouncing-upon-us’ piece…but as we approach, as I write this, the tenth of the tenth, what I have always called one of the ‘’d’escalera’’ days…the countdown away from fiesta, not to it…it’s still a good time to publish it. After all, as we in the northern hemisphere head into winter, and our southern hemispherean cousins head into summer, what could be better than a little Pamplona related reading to get us through the long months ahead until next fiesta. After all, maybe ya falta mucho…but ya falta menos! Great title, eh? I always like a good title or a play on words for these pieces, and I’m surprised I haven’t thought of this one before, and to be honest with you…I haven’t even thought of it now. 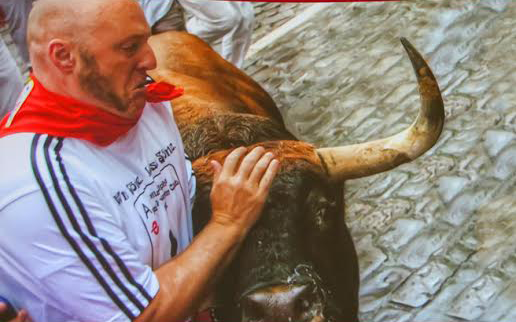 But as we approach the avalanche of alegria that is Pamplona in party mode, bulls before breakfast will be on many, many people’s minds, whether they run or not. I’ve been writing and reading more than usual since before Christmas about all things sacred San Fermin and phenomenal fiesta related, and had already decided a while ago that as a follow up to a wee review of fiesta related books that I did for these pages and the locos of Kuku back in December 2012, (it was called ‘Viva San Thirteen!’ – see, I told you I liked a good title, and it should be found round about here), that I’d write another one of some books I’d recently read that had something to do with Pamplona. So as we head rapidly into the tunnel that is the last few days before fiesta and the explosion of light that heralds the start of all things hedonistic, human and hooved relating to Pamplona, (and spiritual too…the city moves people,) I’m going to start with a quick summary of three great books I’ve read that if you can get hold of will add immeasurably to your fiesta library, if you don’t have them already. Then I’m going to end with what must so easily be the newest book out there that it isn’t, as I write this, actually…out there yet. It’s title? Bulls Before Breakfast. Launch day, (actually, more like lunch day knowing the fella,) is Tuesday June 30th. I’ve actually read it three times now, twice on a pdf version and once with the real, bona fide book between each hoof…which is really how I like to read a book. And I’ll have to express an interest here…I know the author. I can’t say I know him too well at all, but trust me when I say – if I didn’t like the book, my honesty wouldn’t allow me to write a decent review of it. And to be truthful with you, (because I have to be,) I really don’t just like the book. I love it, actually. The review comes after three other books I want to mention, just to build up to it, but suffice to say it is about so much more than just fiesta and the running of the bulls. It’s by a runner called Peter Milligan and he’s written an absolute hoof stomping, tail-twitching, horn-flicker of a book about a place I love. Amongst all his prose about this and that, and indeed the other, are many great lines and quotes that add to the overall theme of the book. There is one truly beautiful humdinger of a line that when I read it, I just knew beyond any reasonable doubt that this man understood not just the encierro, but fiesta in general. He just ‘got it.’ Because it’s how I feel, (it’s giving me goose-bumps as I write this now,) as someone who fell in love with the place within his first few seconds of entering the square on his first visit. I knew nobody, knew practically nothing…but I just knew. Last summer I was proud to have published in the local Diario de Navarra newspaper, in English, a series of articles starting from the day before fiesta, the 5th of July, and ending the day after, the 15th, about all sorts of things related to fiesta but also other things, history, days out, a real smorgasbord (except in Navarra it’d be a pintxo-platter) of all that is beautiful in the region. Well, Peter’s book has all that but so, so much more. He said he was a barista and so I thought, well, if he only serves coffee in a café or something he can’t be up to much so I’ll sue him for nicking my articles and ideas and putting them in a book. Then I realised he didn’t mean barista but barrister so I’ve changed my mind. 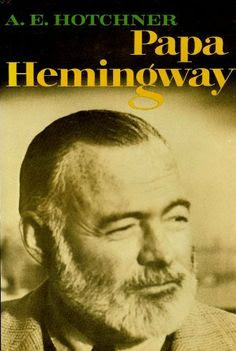 PAPA HEMINGWAY by A.E. Hotchner. A cracking tale of the last 13 years of the great man’s life, as told by his friend and editor for those years. It’s different to most biographies I’ve read of Hemingway, because Hotchner doesn’t need to trawl through correspondence and stuff, as he was actually by his side on many an occasion, recording device in hand and hence there is a lot more dialogue in this book than you’d normally find. As always with a well-known figure, certainly one like Hemingway, there are many different views one can take, especially as over 50 years have passed since he died, and I’ve heard and read about the odd family conflict between various family members – remember, it’s quite a large extended family now, but Hotchner’s book is very much on Hemingway’s side, written by a friend about another friend. And because of that, it is a very personal, and one sided story, but it doesn’t pull away from the darker side of its subject, either. I found it a fascinating story that didn’t just take me back to that last decade of Hemingway’s life, where he went from a fighting fit 50 year old who went hunting, shooting, fishing, and travelling, to an old man in his late 50’s with mental problems and its almost inherent consequences that dragged him down to that awful, perhaps inevitable end. That said, this is a lovely, vibrant book that, thanks to the recordings Hotchner made, really gave a voice to the old fella, and adds to the many tales about this icon of the 20th Century’s life. I love this book. Written by his fourth and last wife and published in 1977, sixteen years after his death, it is, (in the second hand version I have,) nearly 550 pages of very small print. It is a long book to read, but thanks to the prolific diaries she made, I found it not just a fascinating history of the great man since she first met him in the London of World War Two, but so much more, too. 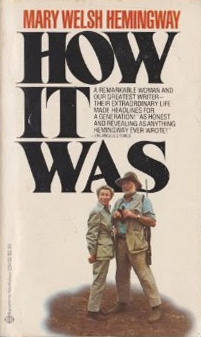 I know people may just want to skip to the bit where she first meets Hemingway, but trust me, please don’t. She writes beautifully about growing up in the woodlands and waterways of Missouri, and her accounts of her first job in ‘the big city’ and how she ended up in London are really interesting. As are her stories of being in the England, France and Germany of pre-World War Two, they are just fascinating…and that’s all before the outbreak of war, her wartime adventures and then meeting Hemingway. Then the story really takes off. I have been saving the Hotchner book and Mary W-H’s book to read for a long time, as I had a feeling I’d really enjoy them, and didn’t want to get them too soon as then, well…that’d be it, I’d have read them. But, after about 25 years, I thought the time was right, especially as I needed to read them for a current project. And boy were they both worth the wait. Mary Welsh Hemingway’s book has such feeling for its subject, (not surprisingly,) along with a love for the natural world, (despite the amount of creature deaths due to all that hunting, shooting and fishing,) while all the time being a wonderful and adventurous travelogue of a world at war, (twice,) followed by a world at peace, or at least as peaceful as it ever gets. Her accounts of their life in Cuba and travels in America, Europe and Africa in those far off years of the forties and fifties bring to life what it was like for the fortunate few able to live (and spend) freely in those post war years. I thought Hotchner’s book was great but somehow the content wasn’t a surprise…perhaps because I’d once read a few (beautiful) paragraphs from it and had hoped the whole book would be like that…and it was, but Mary Hemingway’s book was an absolute eye opener. She writes beautifully and movingly and although I don’t think the two people were great friends, it’s for that very reason you get two differing views that complement each other perfectly. Hans Tovote. For the love of Pamela. My surprise wee book of last year and a little gem to hoof. Actually, it isn’t about fiesta at all, it’s just a story that happens to be set during fiesta, in this case the one of 1988. It’s a story by a Swede about a Basque family that I read in English, (crikey!) of those politically turbulent times during the fiesta-frenzied days of San Fermin. I shan’t go into too much detail about the story, as I don’t want to give anything away, suffice to say it’s about family and friendship, love and life, (if that sounds boring, trust me, it isn’t) and a central mystery that little by little reveals itself as the fiesta gets into full swing and the events portrayed in the book wind up to its conclusion. Okay Sanfermineros, be ye runners or not, old hands or not. As I write this there’s just over a week to go until fiesta begins, and if you’d like to read something to really get you in the mood, (as if you need it, did I say there’s only a week to go?) then this book has got to be it. And if you’ve never been before but are going or thinking of going…it is one heck of a cobble pounding introduction. As I mentioned above, in my involvement in this book as an advance reader, enthusiastic but amateur advisor, pedantic linguistic spelling corrector, political fence-sitter, history loving enthusiast and all round dolor del culo…I’ve read this book three times. Gadzooks, yes, three times! 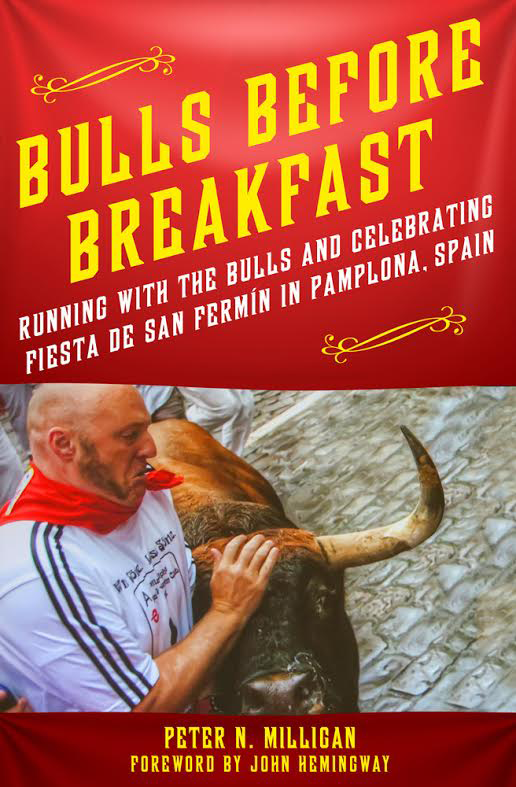 I think this is a cracking book, a hoot of a bull running tale, but also an honest and down-to-earth guide not just to the encierro but to Pamplona and the surrounding areas too, its villages and towns, coast and countryside, history and gastronomy. And it made me laugh too, really laugh in parts and it’s always nice to read something that you think might be quite serious and overly self- important, and find out it’s actually quite funny and self-deprecating. So, where to start? At the beginning, I guess. About ten years ago two brothers who aren’t related but seem just as much siblings as my brother and I are, came to Pamplona. And like happened to so many of us, a small town in northern Spain, in the ancient Kingdom of Navarra, changed their lives forever. And after that, there was no going back. Which although literally correct, is factually wrong, as there was a lot of going back, every year in fact, because Pamplona in fiesta does that to you. It’s magically addictive. ‘’Bulls Before Breakfast” is a great book. It’s funny, colourful, and chockfull of the kind of insider knowledge that anyone who wants to run with the toros bravos (and live to tell the tale) needs to remember.’’ That’s not a bad quote to start the book off with, and it’s not even from the author but from the foreword, written by John Hemingway, grandson of Ernest. This book has pedigree. It’s a nicely laid out book, too, with pre-chapter quotes from folk as diverse as Jake Barnes, ‘ I go to Spain every July’ (he’s the lead character in Hemingway’s Fiesta/The Sun Also Rises,) to ‘I can swim’ from one Aryeh L. Deutsch. (You need to read the book! )… John Wayne’s in there, Ferris Bueller too, Then the chapter begins with a nice little preamble about something or other that sets up the main thrust of that chapter’s story. I’m not a professional reviewer of books by any means, but I have for fun reviewed a couple of books by a couple of friends and they have been easy to do, but this one is tricky, (in the nicest possible way) as it springs things upon you here, there and everywhere, exactly like fiesta does. But as a guide to running, getting injured, the risks, the dangers, the idiots, the crowds, the fear, the fun, the adrenaline and yes, the death…it is superb. One of the many lines that leapt out of the page at me, and that hammered home just exactly what can happen in the run, is this: ‘Death lurks around every corner during fiesta, and it has really long horns.’ And it can, and it does, and damn I wish I’d thought of that line and it is true and is one of the reasons why I gave up running. Early on in the book he writes about a run and his injury from it and it took me right back, right there, to those far off days of glory when I swear I wasn’t just running with the bulls, but flying with them too…my skin was tingling when I originally read it and I was shaking and I’ve got goose bumps now just thinking about it. There’s a lovely quote from one Matt Warshaw, who Peter describes as a ‘surfer philosopher.’ It’s this: ‘surfing…turns not a skill into an art, but an inexplicable and useless urge into a vital way of life,’ and although Peter is equating this phrase with the encierro, (and it sums up its effect on people perfectly) you can also use it to describe the part that not just any fiesta, but this fiesta, San Fermin’s, plays in so many lives. The second part of the quote proves it, in that: ‘surfing, (for that read bull running, fiesta, etc) generates laughter at its very suggestion.’ Aupa to that! Time for a top wee word from Ari, I reckon, and it comes at a lyrical and poetical point where Peter is describing leaving the hotel in the morning before the run: ‘It’s just before sunrise when we leave for the encierro, but it looks more like twilight. Already, swallows are circling the city, squeaky, sharp chee-deeping and eating every mosquito available (you will rarely get bitten in Pamplona). The sky is electric blue, the streets are wet and clean…There’s always music playing in the distance. 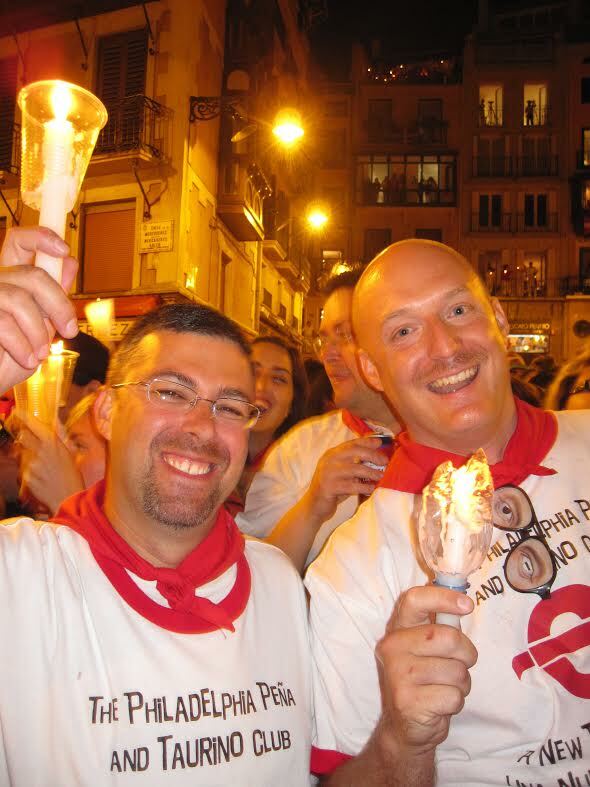 For us, it’s our favourite quiet moment of the San Fermin fiesta. Ari likens it to the feeling of getting to Disneyland before it opens.’ (My italics.) Lovely. It’s nice to read a story where you know a lot of the characters involved, (for this is most certainly not one of those ‘me, me, me’ books that purports to be a story about this that and the other but ends up being a tribute to me, myself, and nobody else…) and I just know that if you get this book and read it without knowing anyone involved, but it makes you go to Pamplona…you won’t just end up meeting some if not all of these characters, but you’ll be given that extra bonus, the Pamplona present that never gets old and broken…friends for life. And that is it in a gold plated nutshell. The Pamplonicans and Navarrans are a wonderful bunch of folk, open and kind, warm-hearted and generous, and as funny a bunch of people you’re ever likely to meet in this universe or any other ones. And with them you don’t just watch fiesta, you become a part of it, and glory of glories, a part of them, too. Peter asked me to be one of the contributors to write something on the back cover, which was a first for me and real honour, trust me…but first I had to like the thing. As I began reading it I pretty soon realised just what a great book it was…of course, I don’t agree with a few things…like I said, he’s way too lenient with the French…but quite honestly it’s a belter of a book and in the depths of an English winter his story had me pining like mad for Pamplona, its people and its fiesta. And it is. And thank you Peter for asking me to be one of those to contribute to the ‘back blurb.’ A first for me, and a real honour. We hear the whoosh. It sings to us. That is the humdinger of a line I was talking about earlier, the moment when I knew, just knew, that Peter ‘got it.’ I love that line, and it sums up, again, just exactly how the place, and it’s people, move me. After 32 years that is probably the best description I’ve ever read about just what Pamplona means to me, and damn you Peter, in the best way possible, for writing yet another line that I wish I’d thought of. I love this book. It is a lovely story, well told, and whether it’s your first time, second time or umpteenth time…why not stand in a cobblestoned street with your arms akimbo and feel the whoosh and let fiesta sing to you.